After years of begging, avid Steam users will finally be able to access Valve's gaming platform on mobile devices. The company announced yesterday that Steam applications for both iOS and Android are readily available for download through each operating system's respective marketplace. Although you can install the app, it's still in closed beta so you can't login if your account isn't approved. However, by attempting to log in, your account is entered into the pool of potential beta invites. There's no word on how the invites will be distributed or when the service will be opened for everyone. 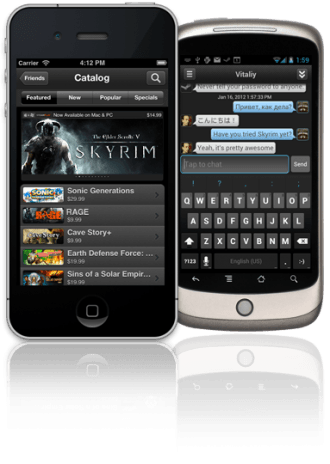 Simply called "Steam Mobile," the app lets you chat with your friends, view gaming news, monitor hot sales as well as browse user and group profiles. We don't have beta access and it's unclear if all profile features are present, such as the ability to view achievements and your Team Fortress 2 inventory. You can, however, browse Steam's catalog and add titles to your wishlist or purchase them from your handset. Obviously you'll only be able to play the games on your compatible PC or Mac and not your smartphone, but it's still handy if you won't be home to take advantage of the store's daily promotions. Steam Mobile was rumored last March and its arrival will undoubtedly spark the same question: why the heck doesn't Valve sell mobile games? That's surely easier said than done, but perhaps the company has grander plans for the coming years. For now, you'll have to be satisfied with a community portal.